It’s been ten years now, but Raku Ichijou has kept his promise. As a child, he and a girl promised to get married once they reunited. Raku kept a locket and the girl kept the key to open it. Now, Raku is a high school student, and he has some issues on his own. Basically, his family are the Shuei-Gumi yakuza, and his father is the leader. Of course this means Raku is meant to be their heir. But Raku dreams with a simple life, he likes to cook and would love to go to college. But as a yakuza heir, that might be a little difficult to achieve. One day, Raku walks to school wondering about his life and, with his chained locket in his hand, he thinks he has never had a girlfriend before, still he cherishes the locket with hope. Suddenly, a girl, Chitoge Kirisaki, falls in top of him leaving a nice kick on Raku’s face. Chitoge runs and briefly apologizes, leaving Raku in the floor. The next Raku knows is that Kosaki Onodera, one of his classmates is taking care of his injuries. Kosaki is a sweet girl and Raku can’t stop thinking of her. Suddenly, there are news, a transfer student has arrived, and it is Chitoge. Raku and she begin to rant and discuss about the incident early that morning. To make things worse, Raku has to take care of Chitoge while at school. Raku is annoyed, especially when he finds out he has lost his treasured locket. He blames Chitoge and basically forces her to help searching for it. It’s been a couple days now and Chitoge is sick of searching and tells Raku he shouldn’t worry about this locket, after all, the girl who gave it to him might have forgotten about it long time ago. In the end, Chitoge finds the locket and throws it to Raku, asking him to stay away from her. Finally at home, Raku’s father needs to talk to his son, the past weeks there has been several fights between the Shuei-Gumi and Beehive gang members. Both parties know each other and agree to end hostilities if Raku and the gang’s leader daughter begin to date. To Raku’s surprise, Chitoge is the girl he must date. They can’t stand each other and now they are supposed to become a couple. Nisekoi was first published as a one-shot manga in Shueisha’s seasonal Jump NEXT! magazine before being serialized in Weekly Shounen Jump. 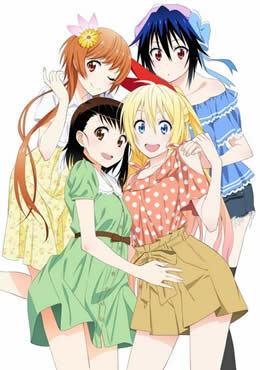 The manga has inspired a novel series, titled Nisekoi: Urabana, written by Hajime Tanaka and published by Shueisha. The anime adaptation, directed by Akiyuki Shinbo at Shaft, began airing on January 11, 2014.